Any New York State ELAP (Environmental Laboratory Approval Program) lab that is certified for lead testing may test for lead in drinking water. There are several ELAP labs registered with Rockland County that perform tests locally for the private well testing law. For general information about the sources of lead in drinking water and how you can reduce levels visit New York State Department of Health. They also have a free pilot program to test lead in drinking water. For information about lead in drinking water at schools and child care facilities visit Environmental Protection Agency (EPA). For questions about lead in your home or water call (845) 364-2608. For questions about health risks related to lead exposure call (845) 364-2500. In September of 2016, New York State passed emergency legislation that requires public schools to test drinking water for lead and prevent exposure from faucets with high levels. Many schools in Rockland have already performed a significant amount of testing and have information available on their websites. Schools will be adding additional results to their websites as they become available. Additional information on the new law and guidance on testing for lead in drinking water is available at the New York State Department of Health. Please contact the Rockland County Department of Health at (845) 364-2608 for more information. What Does Your Child's Blood Lead Level (BLL) Mean? Anyone can get lead poisoning, but children between the ages of six months and six years of age are at the highest risk because they often put their hands and toys in their mouth. Hand-to-mouth behavior is the most common way children ingest lead. Children and adults can also inhale lead particles that may be found in the air. Lead is a naturally occurring element that is found in many places. Lead is toxic to the human body. Lead poisoning is the #1 environmental health concern for children in the U.S.
What are the health effects of lead poisoning in children? Lead interferes with the brain's development and function. It also can cause serious damage to the kidneys, liver and red blood cells. Children are in more danger than adults because their bodies are still developing. The only way to tell if someone is lead poisoned is by doing a blood test. New York State Department of Health requires that all children ages 1 and 2 receive a blood test and that parents of children up to the age of six be asked a series of Risk Assessment Questions to find out if they have a risk of being exposed to lead in their environment. Recent research finds that there is no safe level of lead in the blood. Children often do not look or feel sick when blood lead levels are in the lower range of lead poisoning. A child with these symptoms may appear to have the flu or a virus. The only way to tell if a child is poisoned is by doing a blood lead test. What is the most common source of lead exposure? The most common source of lead is cracking, peeling, chipping or otherwise deteriorating lead-based paint and dust particles. Lead-based paint on windows, doors and other areas where surfaces rub against each other create dust and may cause lead particles to be released into the environment. Are there other sources of lead exposure? Other potential sources of lead include soil, water, occupations/hobbies, imported ceramics or foods, and some traditional/folk remedies and ethnic spices, herbs, etc. For more information: Beware of Lead! Do YOU know where lead may be hiding? Imported children's furniture, toys, jewelry (made in countries outside of the U.S.) may also contain lead. The New York State Department of Health has lists of product recalls. How do I pay for my child's lead screenings (the word screening in this document means a blood lead level test)? Insurance plans and HMOs cover lead tests. You can apply for health insurance by calling 845-364-3394 or contact Community Health Centers that have a sliding fee scale for children who are uninsured. Are pregnant and lactating women also at risk for lead poisoning? Prenatal lead exposure has been known to cause lead poisoning in pregnant women and their babies. For more information click here. Were you born, or have you ever lived in another country? Do you use medicines, supplements, cosmetics, or spices from another country? Do you or someone with whom you live have a job (such as construction) or hobby (such as stained glass or making bullets) than can bring you into contact with lead? Do you use pottery, painted china, or leaded glass that was made in another country? Have you ever eaten or chewed crushed pottery, soil/dirt, paint chips, clay, or other things that aren't food? If the answer to any of the above questions is YES, then the woman is considered to be at risk of high dose of lead exposure and should be screened with a blood lead test. Deteriorating lead-based paint often produces dust that settles on windowsills, floors, toys or other surface areas that children touch. Since children tend to put their hands and toys in their mouth and often eat with their hands ("finger foods"), swallowing or inhaling lead dust is the most common exposure route. Wash your child's hands and face after play, before meals, and before bed. Wash toys, stuffed animals, pacifiers and bottles with soap and water often. Mop floors often, and use damp paper towels to clean window wells and sills. What can I do to keep my children safe from lead? Keep children away from peeling or chipped paint. Before making repairs in a home built before 1978, to learn how to work safely and keep dust levels down. 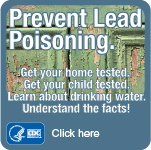 EPA has brochure and guides on working lead safe. Children and pregnant women should stay away from repairs that disturb old paint, such as sanding and scraping. They should stay away until the area is cleaned using wet cleaning methods and a HEPA vacuum (not dry sweeping). Children with empty stomachs absorb more lead than children with full stomachs, so providing your child with four to six small, nutritional meals during the day can also help protect against lead poisoning. There are several nutrients that can help reduce the absorption of lead. Children who are iron-deficient (anemic) tend to absorb more lead because their bodies absorb the lead to make up for the lack of iron. Consuming foods rich in iron can significantly reduce the amount of lead stored in a child's body. Vitamin C helps the body absorb iron. Foods rich in calcium will also reduce the amount of lead absorbed by a child's body. Having enough calcium to support growth and other developmental functions will prevent lead from settling in bones. Foods high in fat increase the amount of lead absorbed by the body. Children need some fat, such as the fat found in milk, cheese, or yogurt, but other added fats such as fat from fast foods, fried foods, or "junk" food may increase the amount of lead absorbed by the body. Parents should try to limit the amount of added fat that a child consumes. Cover chipped paint and holes with contact paper, duct tape, or cardboard. Clean up lead chips and lead dust with a wet mop or a wet cloth. Clean your floors and inside windowsills with soap. Then rinse areas well and throw dishrags and/or towels away. The only way to permanently remove lead hazards is to replace painted surfaces in a lead-safe manner. In Rockland County over 80% of the homes were built prior to the ban on lead-based paint in 1978. Therefore, many of the homes may contain lead-based paint. If home renovations or repairs are not done using lead-safe methods, they can increase the risk of lead exposure in the home. There are many ways to reduce the hazards of lead-based paint and it is very important that you pick the safest method for your particular project. Some people prefer to hire a contractor certified by the Environmental Protection Agency (EPA) that is trained to safely remove lead-based paint. Other people prefer to do the work themselves. Either way, a person hiring a contractor or a person doing the work themselves should become familiar with the measures necessary to safely complete renovations and repairs that involve lead-based paint. You can also call the Department of Health (845) 364-2501 for information and suggestions on lead-safe methods of home improvement. The Rockland County Department of Health will conduct environmental lead investigations for children whose blood lead levels are equal to or greater than 15 µg/dL in an effort to identify the source of lead exposure. A Lead Risk Assessor investigates a child's home and/or other places where the child spends time. Environmental investigations may consist of visual assessment of risk areas, surface paint evaluation, water sampling, and/or other case-specific actions. Based on the results of the environmental lead investigation, the Lead Risk Assessor will provide the owner or landlord with recommendations on how to address lead hazards in the home. At each routine well-child visit, health care providers will assess children 6 months to 72 months of age for risk of lead exposure and screen or refer for screening those children found to be at risk. During well-child visits at age 1 & 2, health care providers will screen children or refer them for screening for elevated blood lead levels. Children age 36 to 72 months of age with a history of blood lead levels of 15 µg/dL or greater should receive follow-up blood lead testing annually. Prior to or within 3 months of initial enrollment, each child care provider licensed, certified, or approved by any State or local agency shall obtain a copy of a certificate of lead screening for any child at least 1 year of age but under 6 years of age, and retain such document until one year after the child is no longer enrolled. When no documentation of lead screening exists, the child shall not be excluded from attending preschool or childcare; however, the child care provider, principal, teacher, owner, or person in charge shall provide the parent or guardian of the child with information on lead poisoning and lead poisoning prevention and refer the parent or guardian to the child's primary health care provider or local health unit to obtain a blood lead test. The blood lead test tells you how much lead is in your child's blood. Lead can harm a child's growth, behavior and ability to learn. The lower the test result, the better. Most lead poisoning occurs when children lick, swallow, or breathe in dust from old lead paint. Most homes built before 1978 have old lead paint, often under newer paint. If paint peels, cracks, or is worn down, the chips and dust from the old lead paint can spread onto floors, windowsills and all around your home. Lead paint dust can then get onto children's hands and toys, and into their mouths. Most children have had some contact with lead in old paint, soil, plumbing, or another source. This is why New York State requires doctors to test all children with a blood lead test at age 1 and again at age 2. For children up to age six, your doctor or nurse should ask you at every well child visit about ways your child may have had contact with lead. Children who have had contact with lead should be tested. A test result greater or equal to 8 µg/dL using blood from a fingertip should be checked again with a second test using blood taken from a vein (often in the arm). If the second result is still high, you should follow the steps below. There is very little lead in your child's blood. The average lead test result for young children is about 2 µg/dL. Your child has a little more lead than most children. Talk with your doctor and local health department to find out how your child might have come into contact with lead, and ways to protect your child. Your child's lead level is high. A result of 10 or higher requires action. Your doctor and local health department will talk with you to help you find sources of lead, and ways you can protect your child. Your child should be tested again in 1 to 3 months. Your child's lead level is quite high. You and your doctor should act quickly. Talk with your doctor or nurse about your child's diet, growth and development, and possible sources of lead. Talk with your local health department about how to protect your child. They will visit your home to help you find sources of lead. If the lead level is 15 to 24, your child should be tested again in 1 to 3 months. If the lead level is 25 to 44, your child should be tested again in 2 weeks to 1 month. Your child needs medical treatment right away. Your doctor or health department will call you as soon as they get the test result. Your child might have to stay in a hospital, especially if your home has lead. Your local health department will visit your home to help you find sources of lead. Your child should not go back home until the lead sources are removed or fixed. Your child needs to be tested again after treatment, and monitored regularly until his/her lead level is below 10 µg/dL. Starting April 22, 2010, federal law requires all persons involved in paid renovation and repair work to be certified in lead-safe practices. Contractors should give the pamphlet Renovate Right: Important Lead Hazard Information for Families, Child Care Providers, and Schools (PDF) to operators of child care facilities and parents of young children who attend child care facilities built before 1978. The Rockland County Department of Health's Childhood Lead Poisoning Prevention Program (CLPPP) began in 1994 and is overseen by the Lead Program Coordinator. It employs the efforts and services of four different divisions of the Department of Health to effectively prevent and treat lead poisoning in children up to age 18.